If you read The Edge Singapore magazine frequently, you should be familiar with this face. 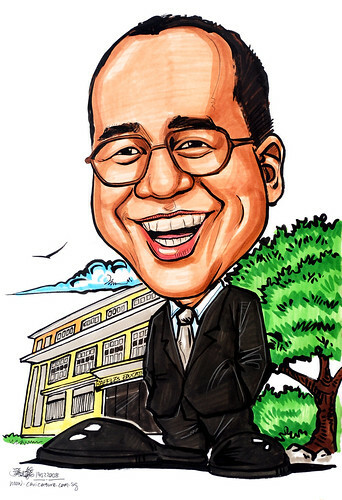 He's the CEO of Raffles Education Corporation. His features are quite unique, especially the mouth/smile. I used a more cartoon approach for his caricature, and focus less on the shades and details of his features, for this round. Just a slight shift in style, that you may not notice it at all. As the photo of the school provided was not a full view, I have to shift it to the left, and the other side blocked by the caricature, and (added in) the tree and bushes.